Their role is to ensure power supply in order to minimize interference in industrial measurements, and allow a connection between the modules and a PC. This interface is designed for operating with new industrial TFX-203 modules. It works with USB or serial interface. 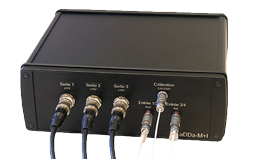 aDDa-I : High stability power supply and RS-232 or USB interface for PC. 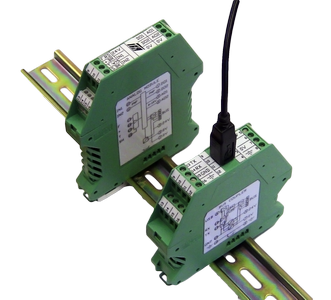 Power with 24Vdc RS 485 bus and modules. Data interface between Tfx RS485 bus and RS232 serial port. The interface is powered by the sector between 85 and 264 Vac. The power is preferably 10W and 15W on request. Assembly of an aDDa-I interface and aDDa-MM measurement module. Configurable with analog outputs, external excitation signals. Laboratory applications for Embedded Systems. Customized configuration on request. aDDa-W : 2.4GHz wireless interface. Establish wireless link between modules or between modules and interface. Ability to create one or more star networks with up to 7 sub-module assemblies. Applications for rotating machines (carousels, heads of machine tools, continuous production of composite panels) or tracking signals in motion (ovens in automotive or food industry). 2 aDDa-I : High stability power supply and RS-232 or USB interface for PC. 4 aDDa-W : 2.4GHz wireless interface.